Dr. Gretchen Champion specializes in otolaryngology-head and neck surgery and treats both pediatric and adult patients with ear, nose, throat and allergy disorders. She is board certified by the American Board of Otolaryngology. Dr. Champion completed her otolaryngology-head and neck surgery residency at Washington University in St Louis where she trained at Barnes-Jewish and St. Louis Children's Hospitals. The ENT program is one of the busiest surgical programs in the country and routinely ranked in the top ten by US News and World Report. While in training, she served as head and neck surgery chief resident and received several awards including the prestigious Head and Neck Surgery Teaching Award from her fellow residents. Prior her surgical residency training, Dr. Champion obtained her M.D. from Washington University in St. Louis, (ranked #3 by US News and World Report Medical Schools for research) where she was an Alpha Omega Alpha honors graduate and received the Robert Carter Award for excellence in research and academics. She graduated with straight A's from the honors program at the University of Michigan-Ann Arbor. She is active in several professional societies, including the American Academy of Otolaryngology, the American Rhinologic Society, and Society for Ear, Nose, and Throat Advances in Children. Her research interests include neonatal hearing loss, head and neck cancer, and microbiology. 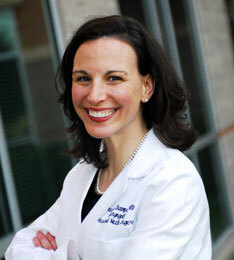 Her clinical interests include pediatric surgery, thyroid and parathyroid surgery, and recurrent ear infections. She performs the Pillar procedure, balloon sinuplasty and employs in-office video imaging for the diagnosis and treatment of sinus disorders, voice disorders, and cancer screening and diagnosis. She has been recognized as a fellow in the American Academy of Otolaryngic Allergy and voted by her peers Best Doctor; in D Magazine for 2009-2017. Beyond her practice, Dr. Champion was recently selected by her peers as Vice Chair of the Department of Surgery at Texas Health Presbyterian Hospital Allen. In addition, she is a Clinical Assistant Professor at University of Texas-Southwestern in Dallas, where she teaches surgical residents and medical students. Read More About Gretchen Champion, M.D.